I somehow misplaced this and then found it while moving a week or so ago. A very tidy find it was too. 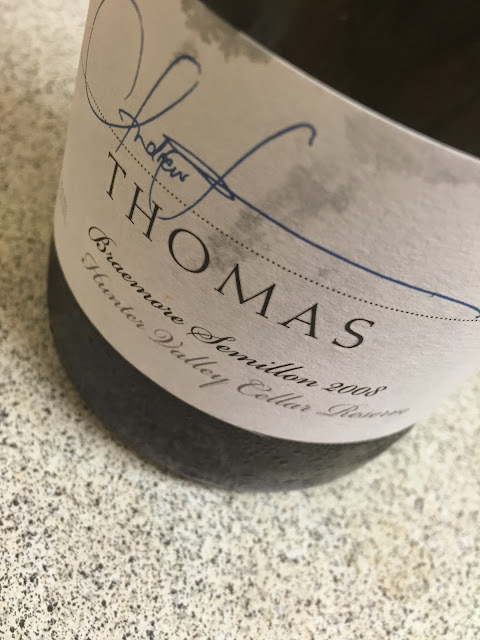 The key difference between Andrew ‘Thommo’ Thomas’ standard Braemore Semillon and this Cellar Release is age, with this breaking cover as a six year old. It comes off Ken Bray’s famous vineyard on Hermitage road, with Thommo getting first dibs of the best fruit. Sourced from a wet vintage that yielded some slightly green, lettucey wines initially (and bugger all Hunter reds) this bottle number 01893 is in a pretty good place. Personally, I’d keep it for a few more years yet, though no doubting the attraction now. Light straw yellow green in colour, still looking very youthful, the aromatics quite reserved and still backward, though there is lanolin and a little hint of chinese noodles too. Layered, finely textured, expansive palate has that superb tension between lemony, ultra firm acidity and then lemon tart creamy citrus fruit tart flavours, in a style that tiptoes between too dry and about right, without every feeling harsh. Still very youthful and arguably too young, the acid here is biting and intense, making for a wine that goes on and on and on, with that acidity and length a stamp of absolute quality. A typically classic cool year Semillon from one of the form winemakers (and vineyards) in the Hunter. I opened this and my sister literally drained the bottle – it’s definitely drainable.